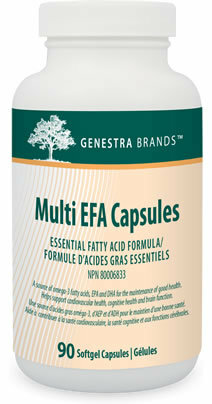 Multi EFA Capsules provides a highly-concentrated combination of essential fatty acids formulated to assist, enhance and maintain cardiovascular, endocrine and immune system functions.The body's natural ability to convert linoleic acid into gamma-linoleic acid is impaired by diets high in meat, eggs, dairy and saturated fats. Studies show that when combining the cold water fish, flax seed and borage oils, the benefits are much greater than when taken individually. it require much work from the liver?? assembled into chylomicrons, which are absorbed by the lacteals (lymphatic vessels of the small intestines). The chylomicrons flow with the lymph into the blood and reaches every tissue in the body. In the tissues the triglycerides are absorbed in a similar way as triglycerides are absorbed by the enterocytes. In the tissues the fatty acids can be metabolized into for example local hormones. Recommended Adult Dose: Take two capsules two times daily with meals, or as recommended by your health care practitioner. Notice: If you are taking blood thinners, consult your health care practitioner prior to use. Guaranteed to contain no added wheat, starch, yeast, gluten, corn, sodium, sugar, artificial coloring or flavoring, preservatives or dairy products.